“How’s the Communism?” she asks, phoning from her own vegetable garden in Long Island. “The Communism” is doing fine, replies Elizabeth. No doubt her affirmative answer is accompanied by a smile as warm as that with which she recounts the exchange. The Communism has been a topic of conversation for six years now, since Elizabeth joined the CSA organized by New York City Coalition Against Hunger. 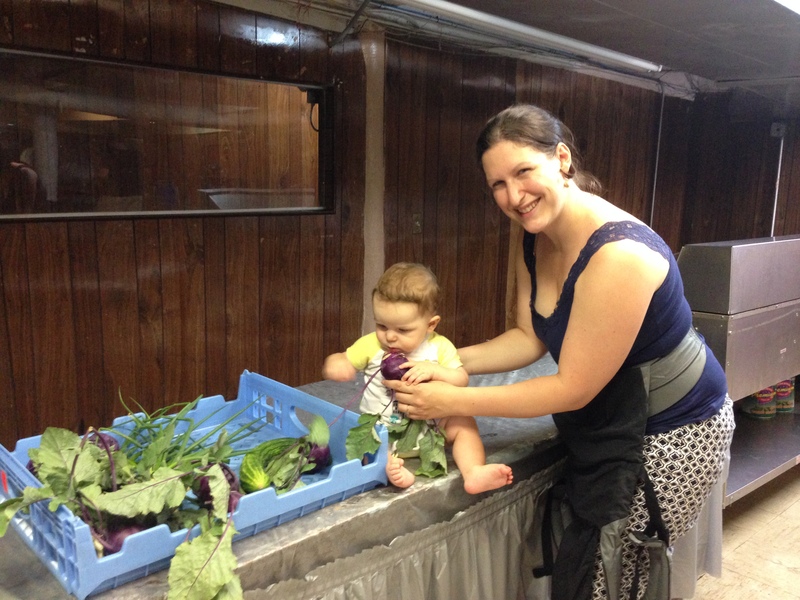 Elizabeth began her NYC CSA participation with the West Harlem CSA when she resided in West Harlem. The weekly basket of CSA vegetables inspired her to plan and prepare meals with an essential creativity. Elizabeth fed her enthusiasm back into the virtuous loop by committing her time and skills as a Core Group Member in West Harlem. In 2010, Elizabeth moved from West Harlem to settle in Crown Heights with her husband, the writer Joshua Furst, and brought her passion for CSAs to the Central Brooklyn CSA. They take turns picking up the share or come together, and they continue to prepare and enjoy their favorite CSA dish of arugula salad with sliced kohlrabi, steak, and a dijon mustard vinaigrette. “We also really like strawberries with whipped cream,” Elizabeth divulges. Elizabeth and her husband share responsibility for caring for their effervescent 8-month old son Ernie, switching several times each evening between cooking and caring for him. Nurturing Ernie has been more of a successful endeavor than tending the potted herbs from the CSA: they have all died. That Ernie’s health glows in comparison is an understatement. Elizabeth will also continue toting her CSA fennel, peppers and onions to her grandmother’s home in Long Island, to cook up a scrumptious-sounding Italian-American dinner. Her grandmother “loves it”– despite its Communist-root connotation. Preheat the oven to 350 degrees. Chop the fennel bulb and onion(s) into medium-sized wedges. Don’t chop finely! Slice the peppers in half longways, and scoop out the seeds. Slice the pepper in half again (longways), and then cut the entire thing in half along the middle. Cut the sausage links into smaller pieces, if desired (I usually cut each link into 3 pieces). Put the onions, fennel, peppers and sausage into a roasting pan, and drizzle with olive oil and sprinkle with salt and pepper. Toss the vegetables and sausage until they are lightly coated with oil, salt and pepper, and put into the oven. Roast in the oven for 15-20 minutes until the vegetables soften. Remove from the oven and put the roasting pan under the broiler. The pan should stay under the broiler for about 10-15 minutes, until the sausage is browned and the vegetables are caramelized in a delicious broth of sausage juices and olive oil. Throughout the time under the broiler, pull out the pan every 4-5 minutes or so and turn the sausages with a wooden spoon, so that all sides get browned and nothing burns. Serve with some good thick bread, or in a hero. Alternatively, you could toss the sausage, fennel and pepper mix with penne pasta– just add a little butter and parmesan or pecorino romano cheese to make the sauce really indulgent!